~ A Tribute To Cinema’s Most Scandalous Publication ~ with discussion with Popbitch’s Camilla Wright and artist Nina Mae Fowler. First published in 1959, avant-garde film director and occultist Kenneth Anger’s infamous exposé has been banned, debunked by academics and adored by millions. 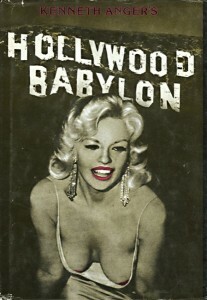 Little Joe pays tribute to Hollywood Babylon with a screening of Nigel Finch’s 1991 BBC Arena documentary, alongside a discussion with Popbitch founder Camilla Wright and artist Nina Mae Fowler about Hollywood’s darker side. The Cinema Museum will display archive material exploring gossip’s role in maintaining the exotic image of the film industry. Doors open: 18.30. Refreshments available. £7.50 / £5.00 concessions / free for Little Joe Film Club Members. Little Joe’s A Little Film Club is supported by Film London’s Community Pilot Fund through National Lottery Funding on behalf of the BFI.